Are you going to Forks? WE are and we'd LOVE to meet you!!!! Here is a fun challenge for those Twilighters out there that are going to Forks for Stephenie Meyer Day 2011 this weekend. 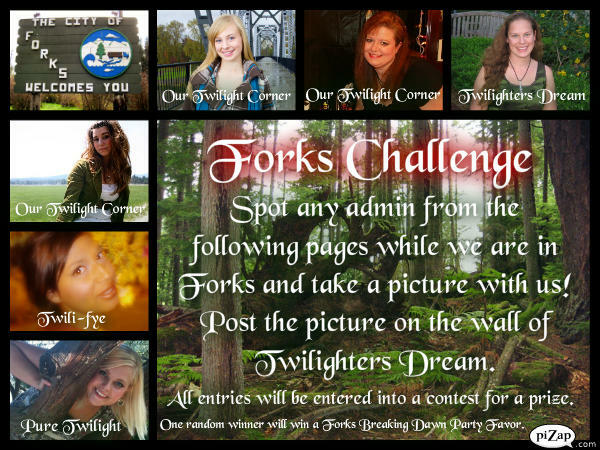 We're calling it the FORKS CHALLENGE!!! Here is the challenge should you choose to accept it! You must visit all four sister pages and select "I am attending" to their Forks Challenege EVENT. Be sure to write on the wall "I ACCEPT THE FORKS CHALLENGE!" 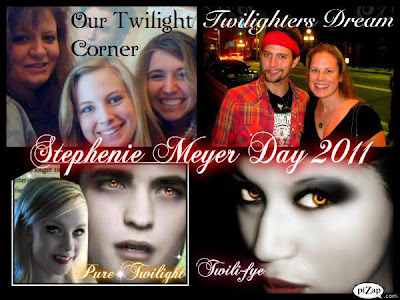 The creators and admins from Twilighters Dream, Our Twilight Corner, Twili-fye and Pure Twilight will be in Forks taking part in all the SMD parties and festivies. We will also be exploring Forks and La Push looking for vampires and werewolves. ;) Each of us will be wearing customized t-shirts with our page names on them. The challege is to SPOT US and TAKE A PICTURE WITH US! You can take a picture with just one of us, two of us or ALL of us! However many of us that you spot! After taking your picture you must post it on the wall of Twilighters Dream*. Everyone who posts a picture will be assigned a random.org number and entered into a drawing for FANGTASTIC PRIZES! Don't worry you will have plenty of time to post your pictures after this weekend. Twilighters Dream will be on vacation exploring the NW until Thursday, September 15th so the drawing will not happen until after she returns to Florida. She will also post updates when the deadline for submitting your photo will be so you don't miss out. WOOHOO!!! We are soooo excited to go to Forks!! This will be so much fun!! We can't wait to see you there!! !